DR Tiling provide a range of kitchen tiling services including Floor Tiling, Wall Tiling, Splashbacks and Worktops. Our extensive experience and wealth of knowledge makes us the number 1 choice for kitchen tiling in North Devon. We offer a no obligation consultation service and are happy to offer advice to clients to enable them to achieve their kitchen tiling requirements. 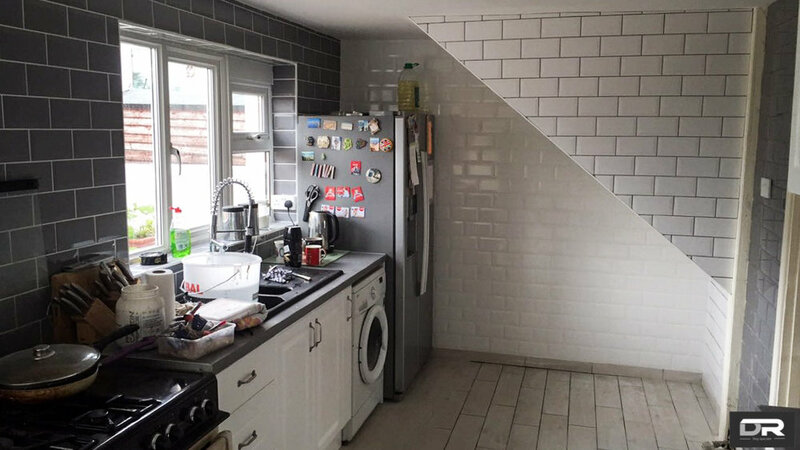 We undertake kitchen tiling projects for both domestic and commercial clients, so no matter the size of your job, DR Tiling have the expertise and resources to produce a high quality finish at a competitive price. DR Tiling carry out kitchen tiling in North Devon, Cornwall, Somerset and the surrounding regions. We are happy to travel anywhere in UK for larger projects so please don’t hesitate to contact us. We are able to install your new kitchen for you. Whether it is a simple refit or major makeover, we can provide installation or your units. Kitchens are now no longer just a place where food is prepared and cooked, but a living space to welcome friends and family. An installation does not have to mean weeks without a working kitchen area. Installations can be planned to suit your needs, often customers go and enjoy a holiday and return to a new kitchen.